Network Rail collected almost £5m in 12 months from people paying to use its railway station toilets, figures show. London Victoria topped the list, with its toilets taking £991,528 between the start of 2016/17 financial year until a 50p charge was axed last December. Campaigners said toilet charges "add insult to injury" and called for them to be axed. Network Rail said the money made was invested in passenger facilities. Stations that charge for toilets include King's Cross, Euston, Liverpool Street, Paddington and Waterloo - all in London - as well as Liverpool Lime Street, Manchester Piccadilly, Edinburgh Waverley and Glasgow Central. Network Rail also runs stations at Birmingham New Street, Bristol Temple Meads, London Cannon Street, London Charing Cross, London Bridge, Reading, London St Pancras and London Victoria, where passengers are not charged. Figures released by Network Rail for 2016/17 show it received £4.8m from the stations that charge. That is down from 2015/16, in which £5.4m was paid by passengers using toilets. Passenger Julie Sather-Browne said: "It isn't free to provide them, clean them, stock them or maintain them. "I would rather pay and have them clean for sure." Kathryn Geels said the toilets "should be a free public service - or at least free if you have bought a train ticket. Going to the loo is a basic need." Figures obtained by the BBC, show passengers have spent more than £41m using the toilet at Network Rail stations since 2007/08. While London Victoria looks like it is raking in the pennies spent in its toilets, per passenger it is not as lucrative as others. The £7.3m income over 10 years comes from being one of the busiest stations in the UK, with nearly 76m entries and exits in a year. Based on official estimates over the past 10 years, and on its current 50p tariff, that works out at 96p for every 100 passengers arriving and leaving. In Manchester, the £3.8m income over the same period, and based on the current 30p charge, works out at £1.65 for every 100 passengers using Piccadilly over the decade. Latest figures from the Office of Rail and Road reveal an estimated 27.8m entries and exits in 2016-17, a total of 230.4m over the course of 10 years. Emily Yates, co-founder of the Association of British Commuters, said: "There should be no charges for people to use toilets. "Passengers are already paying for an expensive ticket and then to have to pay extra just to use the toilet - it just adds insult to injury." Despite Waterloo being named the UK's busiest railway station, Network Rail only has income from toilet charges for two out of the 10 financial years sampled. Network Rail say this is because since 2012 the revenue from Waterloo has gone to the train operating company - which was South West Trains until the franchise was awarded to South Western Railway in March this year. The rail company's UK network is divided into eight geographical routes where decisions, like whether to charge passengers to use its station's toilets, are made locally, it said. 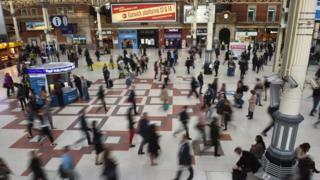 A spokesman for Network Rail said there were no plans to axe toilet charges at the stations. Barriers are installed outside the toilets to prevent potential overcrowding and "deter any illegal activity", said Network Rail. The spokesman said: "We do not profit from these charges. "The small charge we make for using the toilets helps to maintain them and prevents misuse such as vandalism and other anti-social behaviour. "Any money raised from the charges is reinvested into the railway and passenger facilities at our stations."